Ofc. Rick C. Cromwell, 35, was the first officer in the history of the Lodi Police Department to die in the line of duty when his motorcycle collided with a car on Wednesday, Dec. 9. Cromwell, who was in pursuit of a speeder, died instantly from the accident that caused the officer to break his neck and suffer massive head trauma, according to the San Joaquin County Coroner’s report. He was patrolling Kettleman Lane as part of a departmental campaign to reduce speeding on the busy thoroughfare, reported Lodi Police Chief Larry Hansen. He was eastbound pursuing a motorist when Ione resident Jasper Laraway, 85, attempted to make a left turn out of the Vineyard Shopping Center and drove into Cromwell’s path, Hansen said. Laraway apparently didn’t see Cromwell approaching. More than 400 officers on motorcycles thundered through the streets of Lodi on Wednesday, Dec. 16, during Cromwell’s funeral procession. Services were held at the Century Assembly Church, where more than 2,300 gathered to hear Cromwell eulogized as a loving husband and father, and a fine police officer. Thousands of Lodi residents lined the procession route, many wiping away tears as the procession passed. The Lodi Fire Department used two ladder trucks with ladders extended to form an arch draped with a large American flag over the roadway leading into the Cherokee Memorial Park where Cromwell was buried. Colleagues recalled his professional abilities, which ranged from fixing nearly all things mechanical to teaching novices and supervisors the intricacies of motorcycle riding. Hansen spoke of how Cromwell gave of himself to the community through volunteer work and leadership. He said his death had affected the department and the community. Hansen thanked Cindy Cromwell for the countless hours her husband donated to the department, helping other officers with training and working on the department’s motorcycles. He also thanked Cromwell’s parents for raising a good son, a son he said was a credit to the department he served. Lt. David Main told the mourners of Cromwell’s wit regarding the time a newer officer bought a coat and was wearing it for the first time in the station. Cromwell told him the coat looked nice. “The other officer asked him if he really thought so. He replied ‘Nah, I just never complimented you before, and I wanted to see what it felt like,’ ” Main remembered, which drew laughter from the audience. 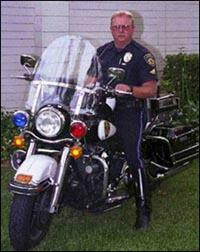 Cromwell was born in Lodi on May 7, 1963, and attended local high schools. He graduated from the Lodi Academy in 1981, and went to the De Vry School of Industry in Arizona, where he earned a bachelor of science degree in computer technology. He chose law enforcement as a profession, and after completing the San Joaquin Delta College Police Academy, he was hired by the City of Lodi in August 1988. Cromwell had been a patrol officer for approximately five years, when he was transferred to the traffic unit as a motorcycle enforcement officer. Cromwell continued his education and training in the field of collision reconstruction. He was a court certified expert in this field, and was frequently called upon to consult on serious accidents for Lodi and other police agencies. He was a critical member of the police department’s Major Accident Investigation Team, and was considered to have a special talent of being able to determine the actual chain of events that caused the collision to occur. Two years ago Cromwell and Officer Lee Patterson instituted the Officer Roadway Program to educate Lodi students about bicycle and pedestrian safety. In June 1998, Cromwell handled a minor traffic accident in which Laraway was involved, Hansen reported. Cromwell notified DMV that it should conduct an official review of Laraway’s driver’s license. A DMV investigator interviewed him and determined that no action would be taken although they did flag his file to review the matter if he had any future driving problems. Laraway’s license was suspended for 30 days following the recent accident. Cromwell was an expert motorcycle rider, and a state certified instructor for teaching riding skills to other police officers to prepare them for motorcycle assignments. He was very concerned with motorcycle maintenance, and took it upon himself to be the lead officer in charge of the maintenance of the entire fleet of police motorcycles. Cromwell was well known for being exceptionally generous with his time and mechanical ability. Some of his many family members would call him to repair almost any mechanical device imaginable and no one could remember a machine that he couldn’t fix. He is survived by his wife, Cindy; daughters, 5-year-old Ashleigh and 3-year-old Lindsey; and parents, Mary and Chuck Cromwell of Lodi. Memorial contributions may be made to the Rick Cromwell Memorial Fund, No. 0102098043, c/o Bank of Lodi, 701 S. Ham Lane, Lodi, CA 95242. We think of you every day and are so thankful for your service.